It took a long time to stop stopping myself. I’ve been my worst friend, holding Fear close and letting it call the shots. Fortunately, aging has added Wisdom to my bag o’ tricks and pushed Fear down. Not that it’s gone, but it’s sequestered, pushed down a bit under a cuddly blanket of Not So Much, No Time for That, and Let’s Do This. It’s a big bag o’ bravery and insouciance. Recently I encountered a heroine, a lady I’d met previously who since then has toured with her award-winning novel of such depth and thoughtfulness that I literally take breaks between chapters to recover, to ingest, to mull. Also, her novel has broken my cardinal rule: if an animal is on the cover, I insist on flipping to the last page to check that the animal is upright and breathing. That’s right, my heart can’t handle a deceased creature within the pages of a book. What was that Cameron movie with the dog, the one that died, like, 5 times?? Inanity! Who would want to see it? Heart-warming? Whatever. More like heart-stomping, emotional trauma my delicate eyes and swooning nature need none of. Look! Emotion has made my trembling, weak fingers end a sentence with a preposition. I tell you, death to critters is a no-no. And this book? This literary work my heroine regurgitated upon her ether screen and put into the world toward great acclaim and a subsequent uptick in Kleenex sales? Cow. Cow on the front. Red hide and sweet, dewy, trusting bovine eyes. And last week I met her again. Bless her. She took the onslaught like a champ. I was manic, a bit crazy, and certainly star-struck. And I accidentally stalked her three more times in two short days. Short for me; long for her. She had no escape. Fortunately, her generous spirit forgave my fan-swooning and all is well. Or she’s a great actor and the warrant for my retrieval is still pending. My point in this extrapolated tale is this: Screw it! I had nothing to lose but to See Through on my semi-neurotic adulation, though well-meaning and big-hearted; it was still a lot weird, I recognized that. And I would have never let it get to the point of handcuffs or Miranda. The Point: see–it-through, whatever you want. Whether you’re youthful or my age, just see it through. The universe loves the weird because we shake things up, whether they’re boundaries or nerves. Things need shaking occasionally. (If anyone is still with me here, the book is called One Good Mama Bone, and the brilliant author is Bren McClain. 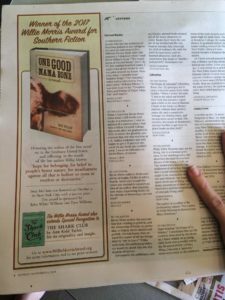 2017 Willie Morris Award for Southern Fiction. This year I sat a moment and examined my previous attempts, all of which met the critical 50K bar of excellence, but none of which completed a story. That’s where the post-NaNo editing was supposed to happen, and when at last I pulled up the files to begin, I got stuck in the morass of my own verbiage and fell asleep a lot. My stories still lie festering and staring blankly until I get the cojones to rework and complete. And what did I do for those half-successful but not to my own par all previous seven times? I Pantsed it. (That’s a real verb in the NaNo world.) I wrote and wrote, with no thought for rhyme nor reason, spewing lyrical genius from atop my cerebellum onto the keyboard with abandon and glee. Ain’t so gleeful now, am I? On October 29th, so so late in the game, I decided I’d make an Outline, the middle school equivalency to torture; loathed them then, loathe them now. But Pantsing wasn’t working, I reasoned. Maybe Plotting was the way of my future, especially if I wanted to finish a story. Being the book geek that I am, I consulted not one but seven tomes on the subject of writing, planning, navigating, and getting-onto-paper the visual translation of the audio in my head. Most all of these helpful books say: Start in the middle. And yet the other half of my brain, the tenacious, not-quite-there side, says no, we gotta figure this out this year. But since I always have finished before Thanksgiving — because who needs to think of a nearly-done novel around the turkey table; no, all focus should be on mashed potatoes — that’s less days. And more reason for my brain to keep throwing images of pants onto the screen of my frontal lobe. I’m telling you, people, I don’t have enough ice cream left for this level of tension and no time to get to the nearest freezer section, because of course I’m in the middle of the prairie. Since I’m reading like a fool this summer, I asked my Bubs which titles he would recommend to other like-minded, but-summer-is-for-NOT-school, video gaming boys whose mothers force them to put down the controller for a hot minute. 5. Big Nate — any of them; funny with a good story. 2. Geronimo Stilton — pick one, there are many (Mom’s Side Note: there are many, many, many); easy to read with enjoyable stories, plus lots of funny mouse humor. It led in interesting directions, so I’m hoping you’ll follow my trail. 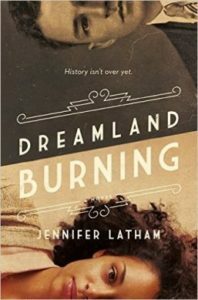 Okie author Jennifer Latham’s “Dreamland Burning” is written for young adults. It’s the story of two fictional young people narrating the account of a very real event, the Tulsa race riot of the early 1900’s. Of course, being regional, the location appealed right away. I didn’t know the book’s premise, and once I opened the covers, I was a bit queasy. I vaguely knew about the abomination that happened in Tulsa’s city streets, when whites got mad that blacks existed and decided to gang up and be jerks, in the very most upper levels of jerky-ness that jerks can be. So insert your favorite incendiary verbiage here, about truly heinous people, and know that racism is the ugliest. And racist packs, fueled by heat and unquestioned loyalty to ignorance, are intolerable. So, at first, until I knew the true subject matter, I enjoyed the references to familiar Tulsa places as much as I enjoyed meeting Will and Rowan, the two leading teen aged characters. 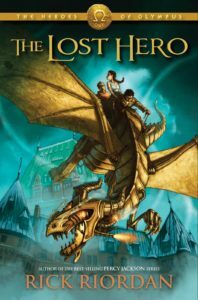 But when their stories kicked into high gear, my heart raced, and I got so involved in what’s-next-what’s-next that the just conclusion came too quickly. I drove through Pawhuska just a couple of months ago — ironically, it may have been April! — thinking it was a ho-hum, tiny town, its most interesting attribute being that its street signs made me slow down for a couple of miles on the way to my destination, another thriving metropolis of about 50,000 folks, an hour or so further down the trail. 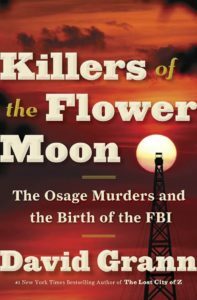 Pawhuska in 2017 did not strike me as eventful in any way, but it certainly was a hotbed of furious — literally furious, unhampered, and evil activity a hundred years ago. Too much terrible history, too close together, in a state that has never seemed overly large but now seems especially tight quarters to fester so much hate. And current Okies know little to nothing about any of it until a full century later? Ignorance of history, atop so much hate and violence, equals further abomination. Read these books. Let’s talk. For reasons I cannot disclose because my Geek Card has been threatened, I’m reading. A lot. In fact, before April, I’m to read 160 young adult books, all published within only this year. If you divide 160 by the alarmingly small number of months between today and then, that’s a whole lotta readin’. Weekly average: like what, 4 or 5? I’m no mathematician; that’s why I’ve been self-actualized enough to jump ship on numbers and swim toward words, which aren’t mean to me. Numbers are evil. And 160 seems like a real villain. Challenge accepted; books are stacked in two piles, one being “To Read” and the oh-so-much-smaller-one dubbed “Read!” And yes, the exclamation point is imperative. Because oh my, I’m earning it, people. Earning that exclamation point. I love reading, don’t get me wrong, but the innocent duress I feel when I’m turning pages is suffocating. There’s always that bigger pile, looming, daring me to take one from the stack. I didn’t realize how much YA novels have in common, either, until I saddled myself with a load of them. I LIKE YA, don’t get me wrong. I really do. But suddenly new releases in the Adult category that I never would have given the time of day are appealing to me. Only because they can’t have me; that’s why they chant. And I don’t want them, not really. Ours is a freaky relationship. Anyway, now that you know the whip goading me on, I’ll be sharing in book chat form, so that you, too, might read one or two of these and share your opinion with me. I need the chat, the back and forth, the sharing. Because I’m knee deep in this rabbit hole and it feels lonely. And the sides are caving in. And I have no food…aw, who am I kidding? I’ve been writing a lot lately, therefore I’ve also been reading a lot lately. My characters sit in my head and chat until I absolutely must write down what they are saying or face a York Peppermint Patty binge, a shield from their words that, while delicious, does not actually fend off the need to write. Therefore, I write. Until I can’t. Reading comes in waves, one I’ve crested and I’ll ride until I can’t. One or twice a year, I tend to eschew reading for Netflix binging, but only on occasion, and books always bring me home. 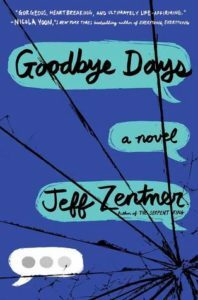 A librarian at a meeting last week told me to read “Goodbye Days,” by Jeff Zentner, because…well, just because. She was effusive in her praise, all the “because” I really needed. She shared the basic premise: 3 boys are killed in an auto accident, seemingly because a 4th boy, their best friend, texted the driver at an inopportune time. So what did I do? Hello, Target Book Section. And after putting the milk in the fridge and assuring myself my Bubs was content with his video games, I opened the novel, releasing its New Book Smell to dive right in. This story is timely, gut-wrenching, and beautifully told. I couldn’t put it down except, oh, when I had to. Two words: Nana Betsy. Oh, who wouldn’t want a Nana Betsy in the their life? After I realized her part of the story was finished, and that she was in fact moving to another state…well, I took a moment to fully ingest her wonder. Such a great character. But persist I did, and many times, I read, re-read. I even wrote a few quotes to share with my book club next month. Such beautiful imagery and heart breaking truths. The main voice is a boy — boys can be crude, and weird, and fascinating. Then weird again. And everything they did or said, in their weird-boy-ways, rang true. I could see it all. I finished the book. I’m asking you to start it. And then come back here, so we can chat. P.S. The voices in my head have added Nana Betsy to the mix. But borrowing characters form other books is a no-no, so…I’ll just enjoy their conversations. My friend Amy came to work the other day and told me of a tiny book she read about losing clutter in her home. It’s dangerous when I listen to what friends read. 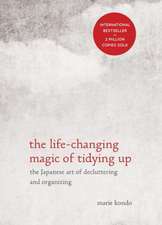 Because of Marie Kondo’s book, “the life-changing magic of tidying up,” Amy said she’d rid herself of non-joy-giving things; if there’s no joy in handling something you own, why have it? Get rid of it. She’d gleaned bits of thought provoking suggestions and ignored the rest of the manuscript, but it certainly made her look at things differently. Her book review stuck with me. I mulled. I’m a mull-er. I mulled until I could no longer mull, and then I had no option but to pick up the mulled book and read. Curiosity was a killer. Without realizing my mulling was having an effect, I tossed a bottle of hairspray; it wouldn’t squirt, thus no liquid was embalming my tresses. Thus I lost patience. Holding the half-full bottle of non-squirting madness over the bathroom trashcan, I announced, “No joy!” and released the traitorous liquid to the depths of the pear green can that sits — also joylessly, I realize — next to the toilet: the perfect burial for “no joy” spray. It got ugly, I can’t lie. But a funny thing happened. After three bags of no-joy-to-me items were insouciantly tossed recklessly into a corner to be discarded later — who cared when? joy wasn’t emanating from the sacks, thus they were dead to me — I let the project go. I let the remainder of the non-joy items sit and think about how little joy they’d brought me and that maybe they should change their attitude. For two days, I dove into the closet, choosing only joy-filled items, ignoring the rest, and living just fine. For two days. And on the third day — joy reigned. Two more bags of items lost their leash upon my life. They, too, suffer in cotton/poly silence in a corner. Then last night at 10:30, I hit a can’t-contain-the-curiosity-any-longer wall. I read the next page of the book. It talked about socks. My socks were stressed, the book told me. Socks don’t like to be rolled into balls within the drawer walls, unhappy in their elastic-stretcher-cized orbs, and it was entirely up to me to alleviate their tension. Poor Bubs woke to my apparently noisy unpacking of spheroid footwear, tossed and unrolled at lightning speed. I cooed, I apologized, I begged the stripes to regain shape, the anklets to resize, the boot socks to think thin. And I repacked the tidy thin parcels as instructed: vertically, in sight, with respect and love. And because I have mindfully re-positioned the alignment of my crew socks, I have room for another twenty pair; extra footage I did not know my dresser could possibly allow. It’s like a chest-of-drawers Tardis. With socks at ease, I did not stop there. I worked until nearly 11, creating tri-fold packets of cotton tees I’d thoughtlessly hung for years. Now they are craftily folded in quarters and squares, vertically, so that I can see their logos and know which shirt is which. Now DMB rests comfortably alongside Billy Joel, all couched between two Dirty 30 5K run shirts so their spines are aligned and I can pull whichever shirt appeals to be worn that day. I slept well last night, I must say, once I finally let myself sleep. I blamed Amy for the late hour, thus I texted her to let her know her reading habits had duly affected my sleep patterns. She replied that though she’d removed all joy-less items from her closet, her socks were continuing to suffer within roly-poly balls, and though she’d apologized and thanked them for their service, their fate was not going to change. So. I’ve perused the next few pages of the book, to see where I’m headed next with this de-clutter project, and I’m hesitant to say the next chapter addresses my much beloved subject: books. I’m gonna need to let this simmer for a while. Meanwhile, my books are shaking in fear. Plus, reading helps with my Compulsive Procrastination Disorder. 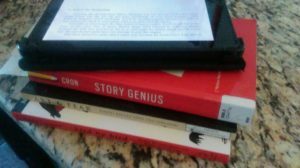 Need to work on my own “novel”? Oh, but the best research is reading other writers! I can do put-stuff-off all day. And I do. 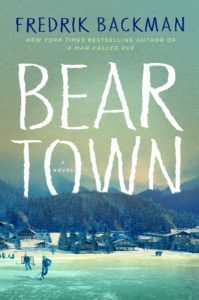 In my internet meanderings — as part of my job, of course — I discovered there’s a new Backman book called “Bear Town” or “Beartown” — I can’t discern correctly if the title is one word or two, as though that matters, but it does because of course I want to get everything just right when it comes to a Backman book — coming in April! The 25th, to be exact, and the publishers better not let me down because doggone it, I’ve spread the word to 800 people that this book will be in stores on that date and there’s going to be a line at book sellers everywhere and holy crow the disappointment river will run deep if it doesn’t happen. And I will be the one crying the river. Since my favoritest author ever, ever, ever, Mr. Pat Conroy, passed away, I have put my displaced adoration for brilliant writing onto Mr. Fredrik Backman, who is Swedish. He’s lucky in that regard, because stalking in English is my only capability. I cannot speak Swedish and I’m too afraid of what Google Translate would do to my well-meaning words of exaltation for his characters and story lines. So to update my Southern reading challenge: I’m on the third book of my list. Maybe Backman is from Southern Sweden? Until the 25th of two-and-a-half months from now, I’m begging for advanced reading copies from every source I can find. Today — less than an hour ago, in fact — I acquired a list of books written by Southern authors, and I have challenged myself to read all items on the list. Thus, I changed “one a month” to “one every three weeks” but ‘cept I have to read one a week for the last three weeks — no matter that it’s the middle of the Christmas season (I’ll have loads of extra time; always do; I read best under pressure) — but we’re now firmly ensconced within the fourth week of the year, so one hour in, I’m already a week behind in my self-applied challenge. And while finding copies of the shortest of the Southern Titles list to read quickly so as to get back on track with my challenge, I found 44 more books I want to read. So now my NEW challenge for this, the second hour, is to get myself back on track for my FIRST challenge. Whew. I’m exhausted and I haven’t even swiped a page. 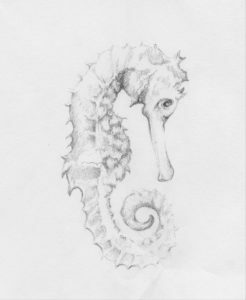 “Why a SEAHORSE?” you might wonder…because my favorite author was a Southern writer who wrote often of the beach, the water, the tide…don’t remember him mentioning a seahorse, but they’re such perfect critters that I’m sure he thought fondly of them. And I thought fondly of him. Thus, the seahorse.